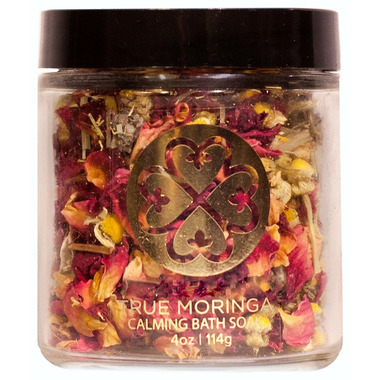 Transform your bathing routine with the True Moringa Calming Bath Soak. Luxurious sweet and citrusy herbs and petals drenched in soothing moringa and scintillating essential oils will make your bath truly relaxing. Anti Aging: Moringa is rich in zeatin, known for stimulating cell division, growth, and delaying aging of cells. Moringa is packed with crucial fatty acids and antioxidants that the fight free radicals that cause premature aging. Anti-inflammatory: Rose petals, balancing lemongrass, and soothing chamomile and sage firm and tone skin, nourishing, relaxing, and reducing the appearance of wrinkles. Paraben free, sulfate free, vegan. True Moringa works directly with a network of 2300 smallholder farmers throughout Ghana, providing sustainable livelihoods through access to credit, agricultural training, nutrition programs, and fair wages. Directions: Sprinkle a small handful of oil-infused herbs and petals under warm running water and soak in bath. Ingredients: Chamomilla Recutita (Matricaria) (Chamomille), Rosa Centifolia (Rose) Petals, Cymbopogon Flexuosus (Lemongrass), Salvia Officinalis (Sage), Moringa Oleifera Seed Oil, Essential Oil Blend.